The Rev. 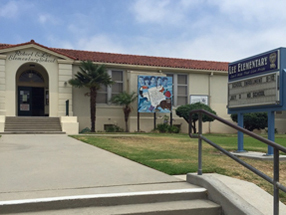 Al Sharpton added his name on Wednesday to the list of activists calling for the name of Robert E. Lee Elementary School in Long Beach to be changed. Sharpton, president of the National Action Network, called it “offensive” to have a school named after the leader of the Confederate army. A group of activists petitioned Long Beach school officials Monday to change the name of the school, joining a national effort to remove references to the Confederacy, particularly in light of the killing of nine people at Emanuel African Methodist Episcopal Church in Charleston, South Carolina. Earl Ofari Hutchinson, president of Los Angeles Urban Policy Roundtable, is leading the effort targeting the Long Beach campus at 1620 Temple Ave.
“The Reverend Sharpton not only endorsed the Lee campaign but also made it clear that direct action by civil rights leaders locally and nationally is a real option to prod Long Beach school officials to scrap the Lee name,” Hutchinson said. Senate Minority Leader Bob Huff, R-San Dimas, announced on Monday he has agreed to become a co-author of SB 539, which would prohibit all public schools, buildings, parks, roadways and other state-owned property in California from using names associated with the Confederate States of America. “It’s time for a change in thinking and how we treat history,” said Huff, a candidate for the Fifth District seat on the Los Angeles County Board of Supervisors.